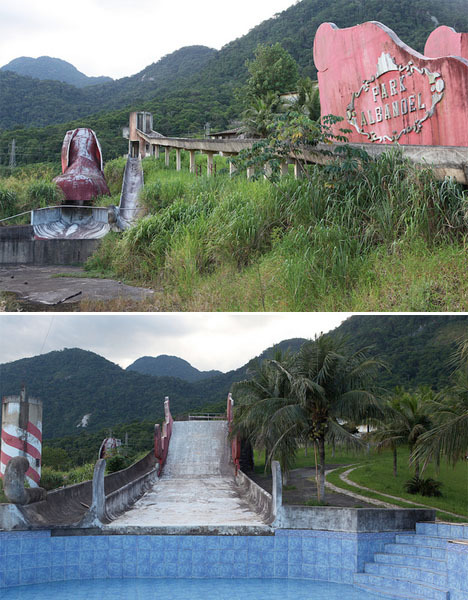 The remains of Henry Ford’s failed rubber-producing city, two rusting theme parks, intricate colonial facades and a railroad that set the scene for 7,000 deaths are among Brazil’s fascinating abandonments. 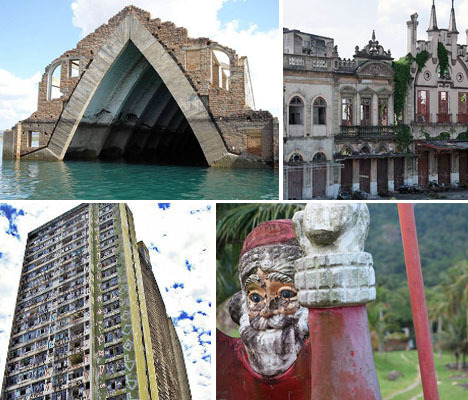 Whether set deep within the Amazon or in the thick of some of the world’s busiest and most metropolitan cities, these 7 abandoned wonders amaze and intrigue. 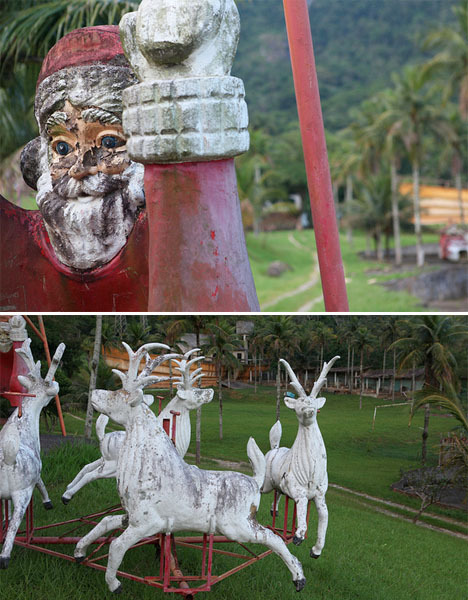 Cidade Albanoel is a Santa Claus-centric park dreamed up by local politician Antonio Albano Reis, who was known as the ‘Santa Claus of Quintino.’ Meant to be the largest themed attraction in Brazil, the park would have also had a bunch of other teemed areas, like a replica of an Old West town. A plot of land the equivalent of 460 football fields was purchased and work began. Water slides were constructed, foundations were laid for the Western town, and Santa Land was completed. But Reis, the money, brains and motivation behind the project, perished in a tragic car accident just outside the gates in 2000, and everything came to a screeching halt. Since Santa Land was already done, it opened to the public, but closed after just a few short years. 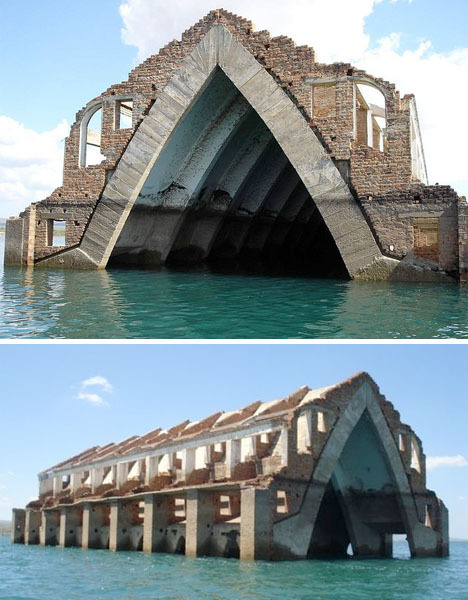 Here’s a nice example of an abandonment that’s actually way more interesting and beautiful after its loss to the forces of nature than it was to start. 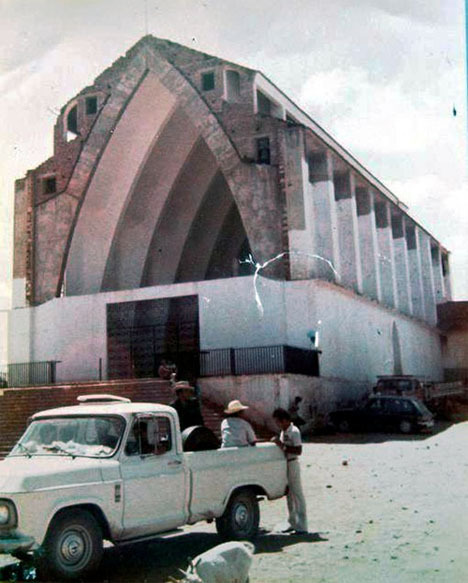 The church of old Petrolândia currently resembles some sort of ancient ruin, a series of brick-accented arches rising from blue-green waters. Most of the town was relocated due to the construction of a dam for a new hydroelectric plant. The remains of the rest were flooded, now lost beneath the surface, with the exception of this one tall structure. In 1928, Henry Ford trumpeted an idealized American city, in the middle of the Amazon: come live at Fordlândia, he told potential employees, and enjoy steady, profitable work in tropical paradise. 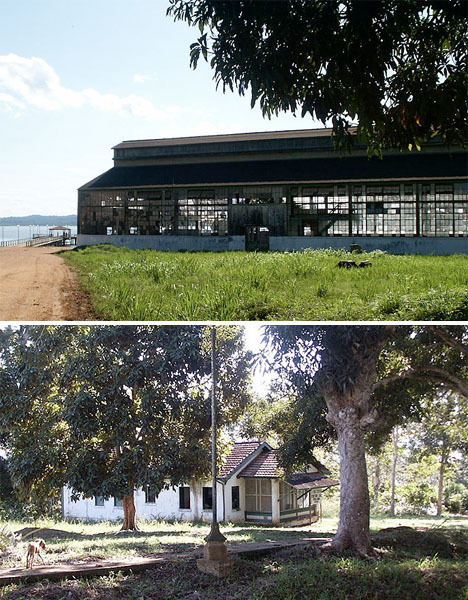 The prefabricated industrial town was established near the city of Santarém, Brazil as a rubber factory to make tires for his booming car company, so Ford could avoid reliance on British rubber (sourced in Malaysia.) But there were problems right from the start. The land was rocky and infertile, and Ford failed to hire managers that knew how to work it or had any idea how to avoid problems like blight and pests in a rubber tree plantation. Few Americans were actually convinced to go, especially since Ford forbade women, alcohol and tobacco within the town limits. Indigenous workers weren’t thrilled about being given hamburgers to eat and American-style accommodations, and they weren’t exactly treated well. On top of all that, Ford never even stepped foot on the plantation. Then, in 1945, synthetic rubber became available. 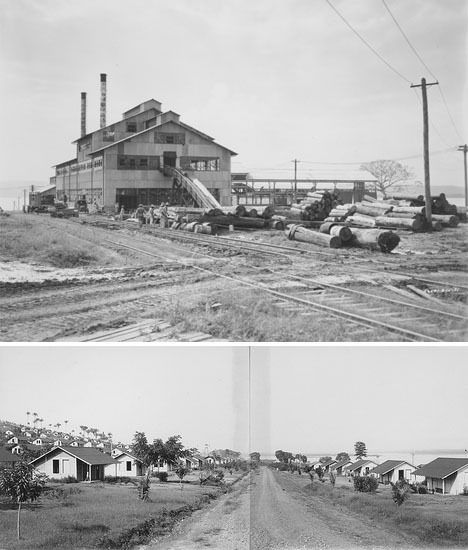 The whole Fordlâlndia project was nixed without ever producing an ounce of rubber for the company, the structures left behind in the jungle. The decaying town included a hospital, power plant, library, hotel, golf course and dozens of employee houses, some of which are still standing. Ford lost over $200 million in today’s money on the enterprise. 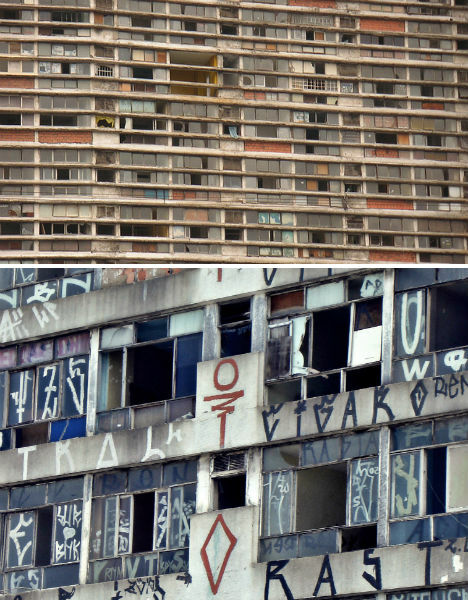 From the time it was built in 1959 until it finally came down in 2011, Edificio São Vito was the city of São Paulo’s largest vertical slum. Referred to by locals as Treme-Treme (shiver-shiver), the 27-story structure was initially meant to provide cheap and efficient accommodations for students, professionals, immigrants and travelers, with 624 apartments measuring about 300 square feet each. But by the 1980s, those apartments were split into multiple units to accommodate thousands upon thousands of low-income inhabitants. There was no trash or sewer service, so waste was simply dumped out the windows. 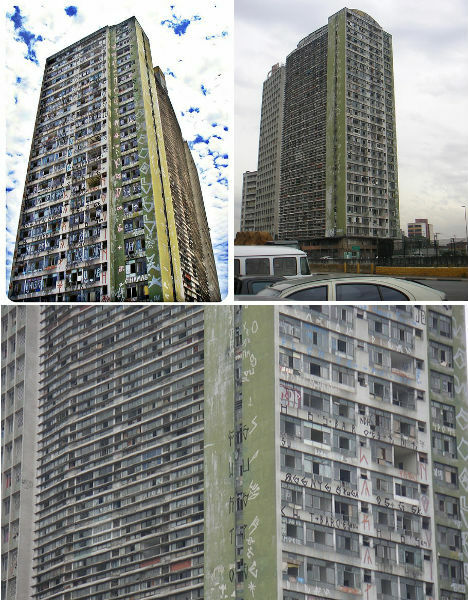 The building turned into one big death trap once one of the three elevators stopped working, and as crime rose, residents began to leave in droves. It stood virtually abandoned for years until officials finally demolished it.